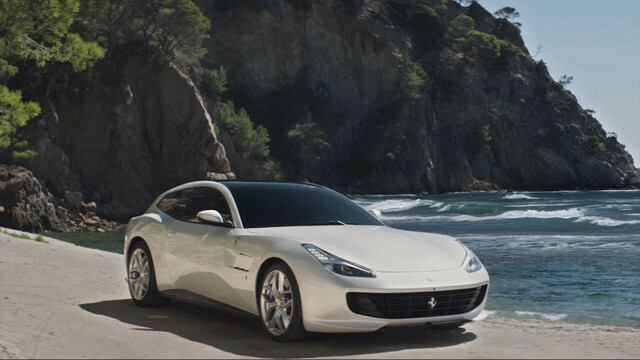 The GTC4Lusso T is the first four-seater in Prancing Horse history to sport a turbo-charged V8 engine, hailing a whole new Ferrari GT concept aimed at owners seeking a car that is sporty and versatile, as well as perfect for driving on a daily basis. The new GT effortlessly marries elegance, superb occupant comfort and sportiness with the thrilling driving dynamics delivered by a combination of rear-wheel-only drive, four-wheel steering, lighter overall weight and increased weight bias towards the rear (46:54). *** The values of fuel consumptions and CO2 emissions shown were determined according to the European Regulation (EC) 715/2007 in the version applicable at the time of type approval. The fuel consumption and CO2 emission figures refer to the WLTP cycle. The car's 3.9-litre V8 turbo is the latest evolution to emerge from the engine family that was nominated the 2016 International Engine of the Year. Its maximum power output is 610 cv at 7,500 rpm while maximum torque of 760 Nm is available at between 3,000 and 5,250 rpm. The V8 turbo’s characteristics suit day-to-day driving in urban contexts: a rich powerful soundtrack in acceleration that becomes more muted at lower speeds, rapid pick-up from low revs courtesy of versatile, modular torque delivery and, last but not least, excellent range. The GTC4Lusso T's dynamic control systems have been specifically calibrated to boost responsiveness to commands. In particular, the 4WS (rear-wheel steering), which is integrated with Side Slip Control (SSC3), makes for more rapid response to steering wheel inputs entering and exiting corners, thanks to the rear wheels steering in the same direction as the front ones. The feeling of longitudinal performance in this new model has been enhanced at low speeds by Variable Boost Management and underscored by throttle response with zero turbo lag. Thanks to variable torque curves (VBM) between 3rd and 7th gear, longitudinal acceleration is consistent through the ratios, increasing smoothly with engine speed, resulting in a feeling of vivid but superbly progressive acceleration. The GTC4Lusso T's styling remains the same innovative take on the shooting brake coupé, reinterpreting the concept with an extremely streamlined, tapered shape that gives it an almost fastback-like silhouette. The cabin is an effortless melding of distinctive Ferrari styling and the luxurious elegance expected of a four-seater GT. The GTC4Lusso T features the unique Dual Cockpit architecture, designed to enhance the shared driving experience for both driver and passenger. It also incorporates the latest iteration of the infotainment system complete with an impressive 10.25” HD capacitive touchscreen.